The photographs on this page were taken by Andrew Smith on an official visit to Worcester Locomotive Sheds early in 1965. The exact date is probably April 1965. Any help in dating these photos would be appreciated. This photograph shows the cramped conditions at Worcester Works. The two locomotives are both visitors to Worcester. 'Hall' class 4-6-0 No.6993 'Arthog Hall' was allocated to Gloucester at this time, but ended its days at Oxford when steam working at that depot finished at the end of 1965. 'Manor' class 4-6-0 No.7814 'Fringford Manor' was probably also a Gloucester engine at this time, although it later went to Didcot for a short time. 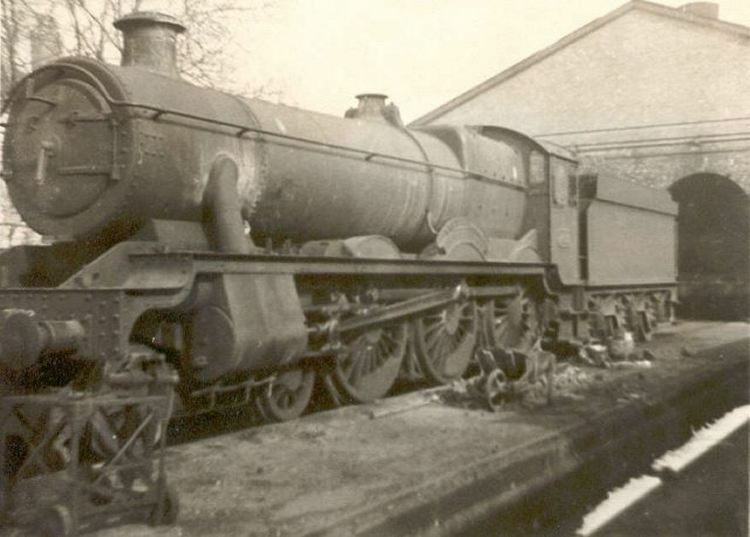 This photograph shows No.7928 'Wolf Hall' standing outside the back of the boiler washout shed at Worcester. Note that the locomotive has lost its front number plate whilst the larger and more valuable side name and number plates are still intact. 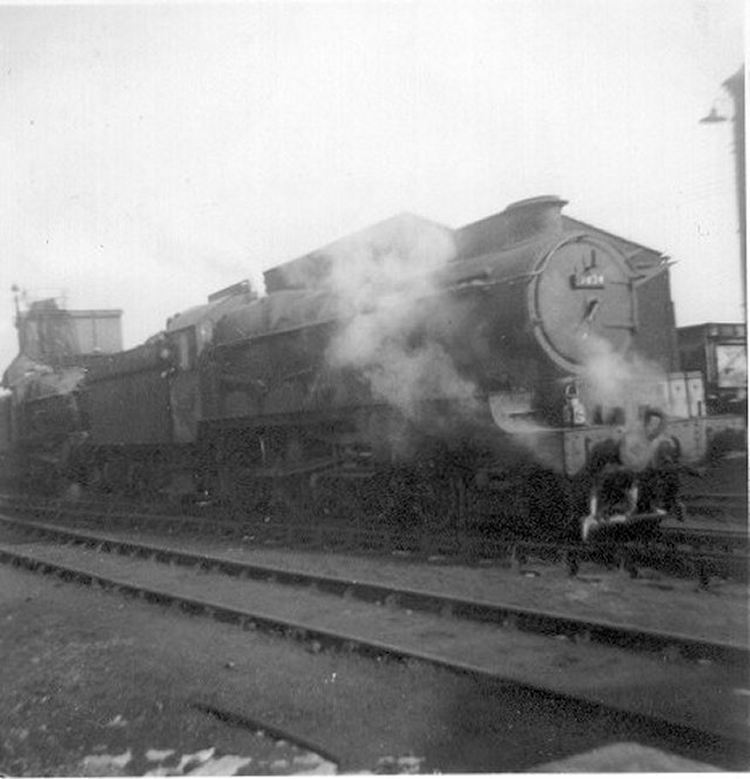 'Wolf Hall' was a Worcester locomotive for all of its life and was withdrawn late in 1965. 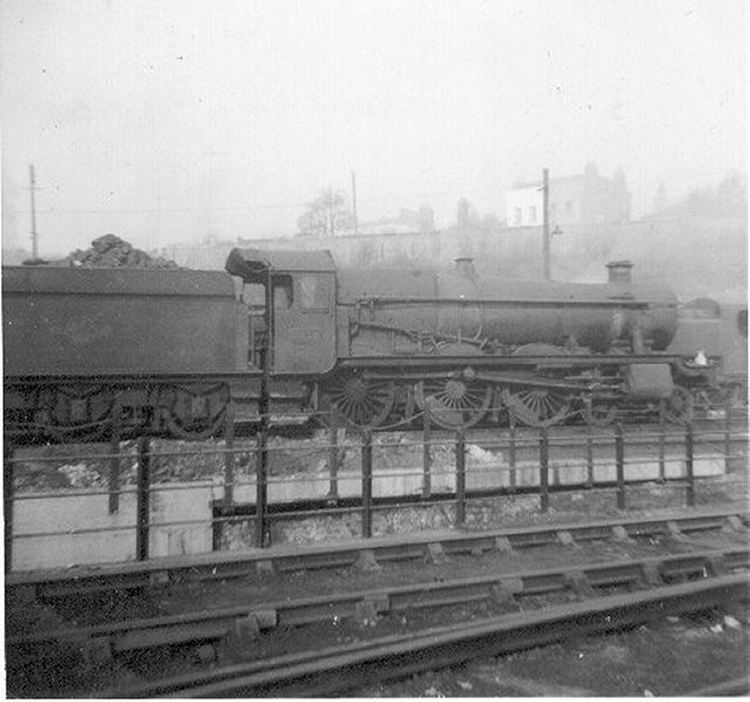 This photograph is the only 'Castle' class locomotive that was at Worcester on the day of this visit. Worcester's last remaining 'Castles' had been withdrawn or transferred away in the autumn of 1964 and by this time the few remaining examples were based at Gloucester. No.7034 'Ince Castle' was never a Worcester loco but was a regular visitor until withdrawal at the end of June 1965. Also in this photograph is No.6869 'Resolven Grange', a 'Grange' class locomotive. Andy Kemeys adds "As you note it was a Gloucester engine at the time and as I recall, she had been for some years, until the end of steam on the London expresses, a regular on the Cheltenham Spa express, leaving at 8.20am. I still have a very clear recollection of 7034 with the express nameboard, pulling hard from the station, coming towards me by Horton Road gates on a cold morning and then on round the curve past the Foundry and wagon repair depot towards Stroud. But that is not why I write. "After June 1965 and before, withdrawn 85B engines were often put in a small yard behind the shed at Horton Road, between Great Western Road and the access road in to the shed proper. You could get there without passing the Foreman's Office! So, after 7034 was withdrawn, she was put there, behind 5017 (I think). So myself and a then friend decided to have a 'look round' in the cab of 7034. During the course of this, a small notice, about '3x2', roughly stamped on to thin steel plate and fixed with wire to the steam brake handle (I think), 'fell' into my hand as a keepsake. 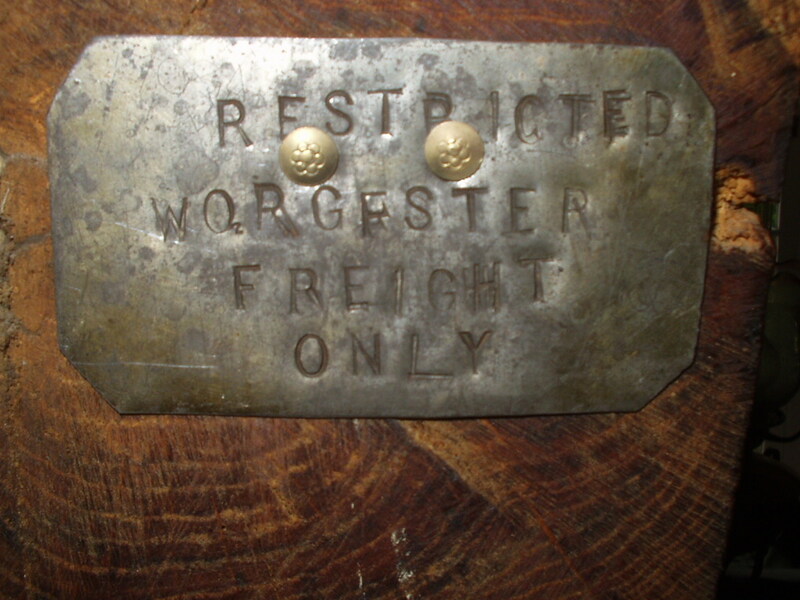 It says: 'RESTRICTED WORCESTER FREIGHT ONLY' - were they afraid to let her out of their sight where anyone in authority might ask an awkward question?. My guess is that 7034 had this very notice in the cab when you took the picture of 7034! I still have the little notice pinned to the beam over my fireplace. If you wish, I would be happy to photograph it and send you a copy if you would ike me to. I would be happy for it to be published too, were it perhaps not too minor a thing to be worth even the webspace. "We did used to wonder at the time if Gloucester & Worcester didn't do their best to keep some 'Castles' going up until the last, as there seemed no good reason to keep such 'unsuitable' engines doing the things they did. 7034 even had a new looking set of centre driving wheels late in the day although it did not prevent the eventual end. In those days, even a short reprieve seemed worth it. I also remember Clun Castle doing all sorts of minor things around Gloucester that a Pannier tank might have been more sensibly used on. And, once, just before it closed and maybe only a few days before the end of steam, Clun Castle was used on local trains between Gloucester and Cheltenham, St James so, for the return journey, she was running tender first!" 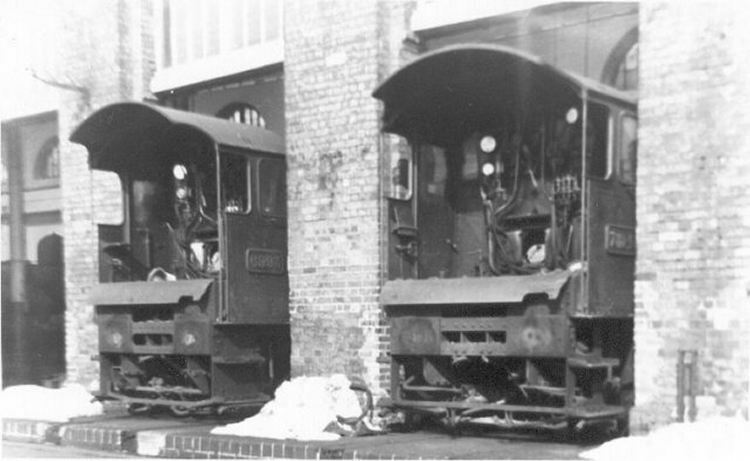 The 8100 class of 2-6-2 tank engines consisted of only 10 engines. They were introduced in 1938 by Collett as a rebuild of Churchward locomotives of the 5100 class. The locomotive in this photograph was originally built in 1905 as No.5124. 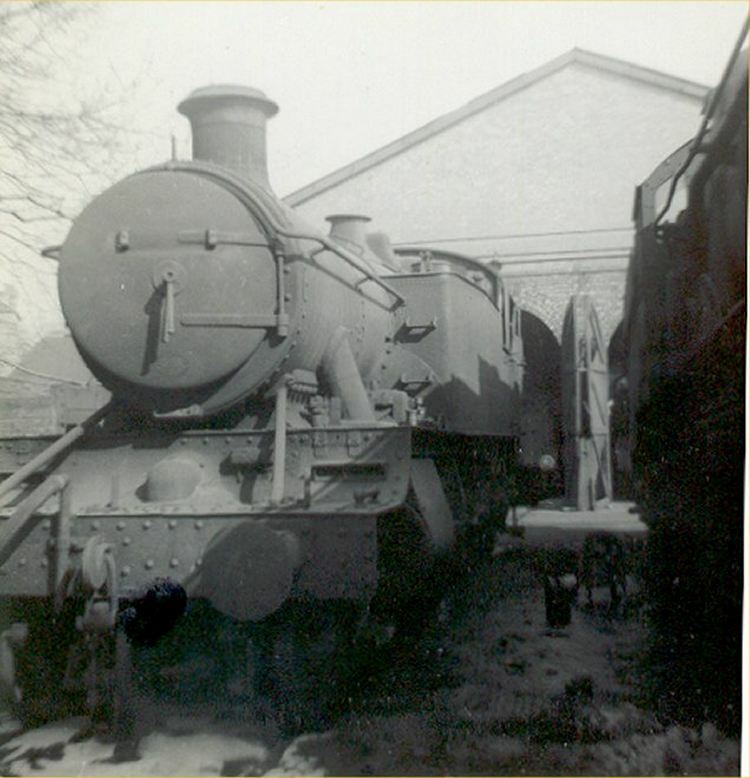 It was rebuilt as No.8104 in 1938. 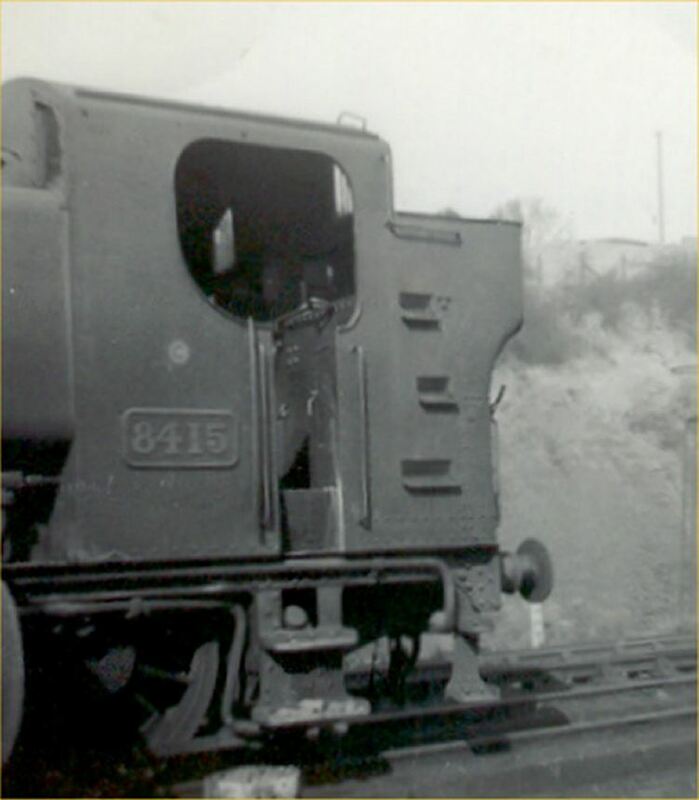 The locomotive came to Worcester in September 1962 after many years at Neath in South Wales. No.8104 was withdrawn from service in December 1964 and dumped behind the 'washout' shed when this photograph was taken. No.5932 'Haydon Hall' was a visitor to Worcester but still in remarkably good condition even though it is missing its nameplate. At this time the loco was probably allocated to Bristol (Barrow Road). 'Haydon Hall' lasted until the autumn of 1965. No.8415 depicted in this photograph was a member of the numerous '9400' class of Pannier tank engines. The '9400' class were introduced by Hawksworth in 1947 and a total of 210 locomotives were eventually built. No.8415 was allocated to Tyseley shed from new in March 1950 and was transferred to Worcester in June 1960 and was withdrawn in July 1965. 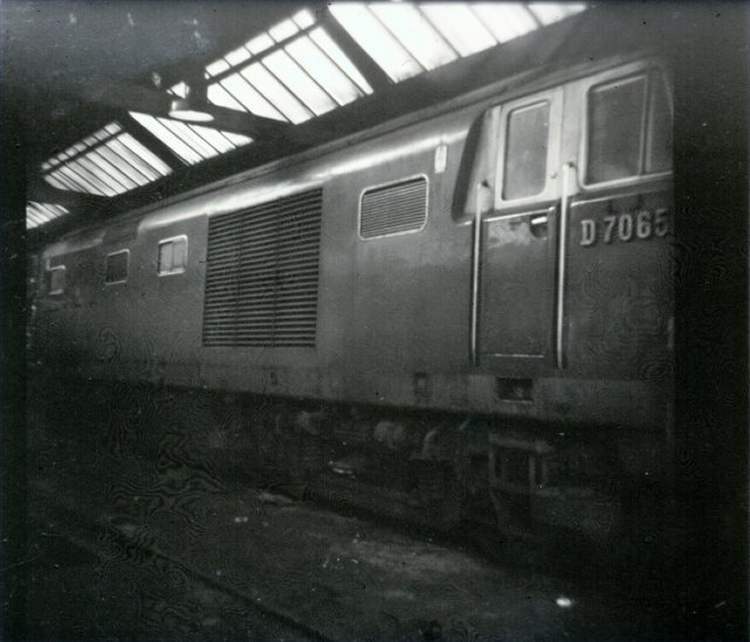 This is a rare photograph of a main line diesel locomotive inside one of the former wagon works buildings to the south side of the main sheds at Worcester (on the other side of the line from Worcester Shrub Hill to Birmingham). This is 'Hymek' class locomotive No.D7065. 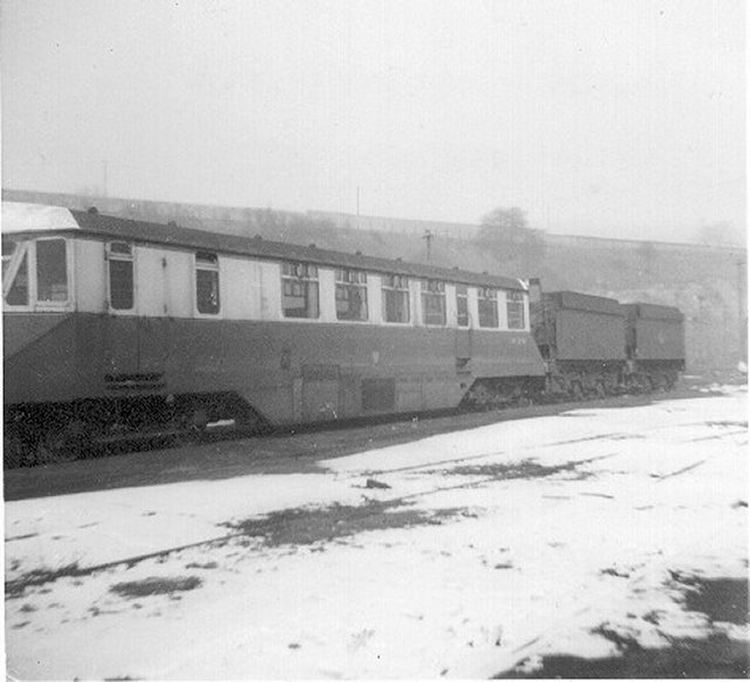 Railcars were a feature of many services in the Worcester area in the 1950s but by this time they had all been long withdrawn. This one survived in store at Worcester and is now preserved. The railcar is seen outside the shed that served as a temporary diesel depot. The two tenders appear to be from withdrawn 'Castle' class locomotives. Note the snow on the ground and the high ground (Railway Walk) in the background where all locomotive movements could be viewed.